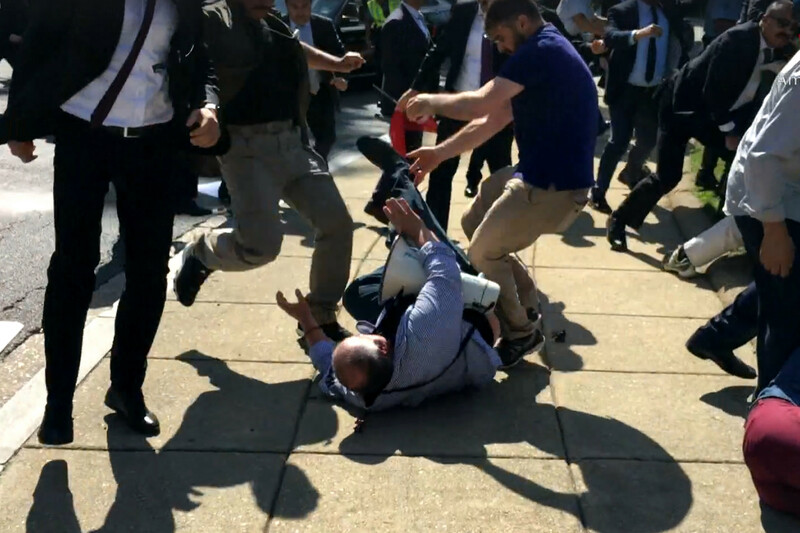 Erdogan's bodyguard and one of his supporters kicking a protester in Washington D.C.
A US Federal Judge issued a decision on the case of the Turkish President’s bodyguards’ and supporters’ attack against protesters, during a visit to Washington D.C. in May 2017, sustaining several allegations of the plaintiffs. Erdogan visited US President Donald Trump, and while he was outside the compounds of the Turkish embassy along with his security detail, a handful of protesters were also there. They were chanting “Baby killer Erdogan!” near the embassy, denouncing Erdogan administration’s military conduct in Kurdish- majority southeastern Turkey. Sound editor, Salih Ferad, analyzed the footage of the scene on behalf of news portal Daily Caller later on. are seen charging at the protesters. The prosecution indicted 19 people, among them 15 Turkish security officials, after the attack. U.S. District Judge Colleen Kollar-Kotelly ruled the defendants will not face charges on several claims brought by the plaintiffs. However, she preserved “the assault and hate crime charges, as well as most of the intentional infliction of emotional distress claims,” the Courthouse News reported. Turkey’s FM Mevlut Cavusoglu visited the two Erdogan supporters in jail in September 2017. The police arrested them in June 2017, on assault charges.